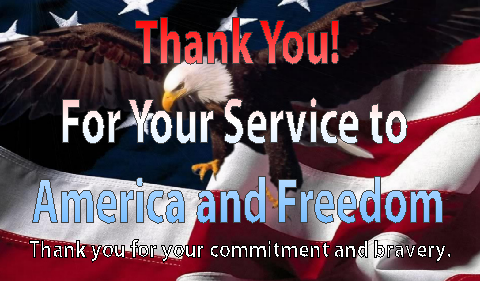 Our family goes out of our way to say “Thank You” to anyone who is in uniform or shows that they did where the uniform. Most often we go up to them, shake their hand, and say “Thank you for your service”. That is the least that we do….. We have been known to buy a dinner or two, un-beknownst to them of course. In addition to us Thanking them personally, we have created and are handing out the cards below, for them to carry with them. Hopefully, it will make their day and will be proud to carry it and perhaps give it to their friends and family so they can pass on the praise. We have worked out a special deal with one of our special vendors (Eagles Lair) to help make this available to you at a highly reduced price. We are doing this for the love of our country and the troops who fight for our freedom and country. Here are the Front and Back of the card. 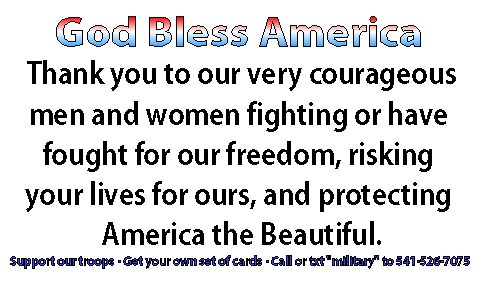 If you would like to order your own set up cards to hand out as you see our strong and brave military personnel, just click on how many cards you want and fill out the checkout form. All Prices Include shipping. Please allow up to 2 weeks for delivery, as it is shipped ground.